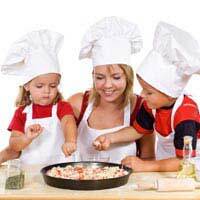 Home > Food Education > Quiz: Does Cooking Style Influence Children's Eating? We all want our children to eat well and learn to love good food, but have you ever thought about how the way you cook and eat could influence the way your children respond to food? This quiz explores some of the good and not-so-good ways that we can affect the way our kids view food and cooking and suggests some ways that you can improve their exposure to food and cooking so that they develop healthy attitudes and behaviours towards the food they eat. Decline politely– you prefer to try new things when you choose to, not have them thrust on you when you’re not ready. Say yes and take a really big mouthful – you love new tastes and recipes. Tell them that they should eat the dinner you have made or nothing at all – it’s silly to let children dictate what they will eat and when they will eat it. Every night – family dinners are important to family stability. E. And where do you tend to eat? At the dining room table, with proper cutlery and table mats. Make everything from scratch, starting several months in advance. If you answered mostly 1, you’re doing a pretty good job of finding a food/life balance. Your children probably recognise that healthy eating is important, but don’t have big issues around food and control. You can probably be more adventurous, perhaps by letting the kids decide more of the meals you eat, and by trying new foods more, but you’re already getting most things right. If you answered mostly 2, you might want to think again about the role food plays in your family. While your easy-going attitudes are great for preventing children having eating disorders, you could be doing more to instil a love of food in your kids: perhaps cooking a favourite recipe from scratch one night a week would be a good way to get you all involved in foodie matters? If you answered mainly 3, it’s possible that your love of food is alienating your children. Although you adore good food and care about its preparation, your perfectionism could be making your kids feel inadequate – pizza in front of the TV once in a while would show that you can relax your standards and perhaps you’d find that a night off cooking would allow you to appreciate your good food more as well.